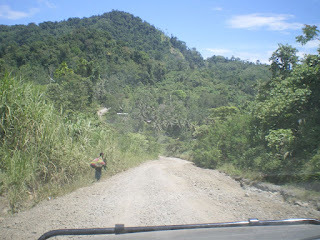 There is a popular song here in PNG that sings about traveling on the “Highway to Paradise” (i.e. 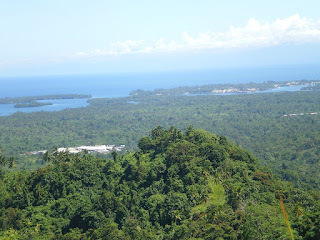 the coastal town of Madang.) It is true that Madang is a very beautiful part of PNG and many people go there for vacations, but the road there is not actually the best. If fact sometimes it is not even passable due to washouts from torrential rains. However, this post isn’t about the highway itself, but a trip I (Brian) made recently on it. In Madang our organization has a training facility for new members coming to PNG. 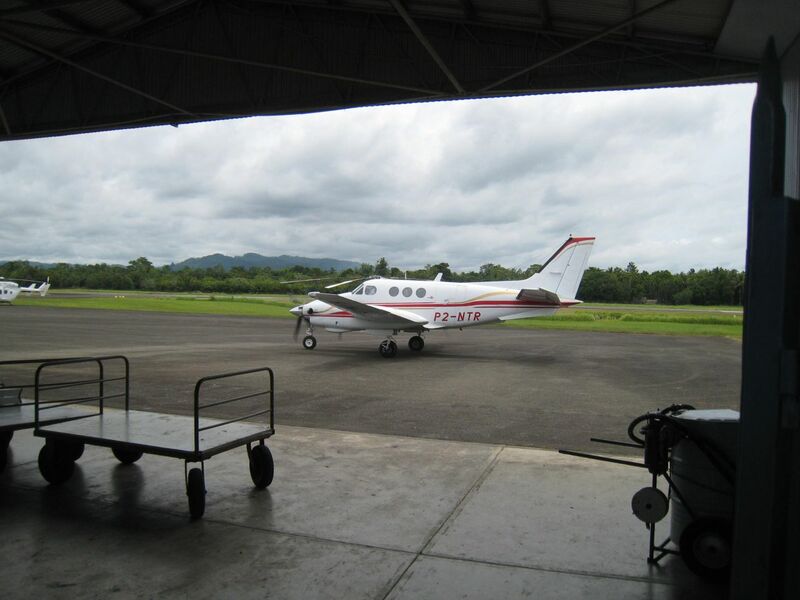 New arrivals learn Tok Pisin, PNG customs and begin their first immersion into life in PNG. 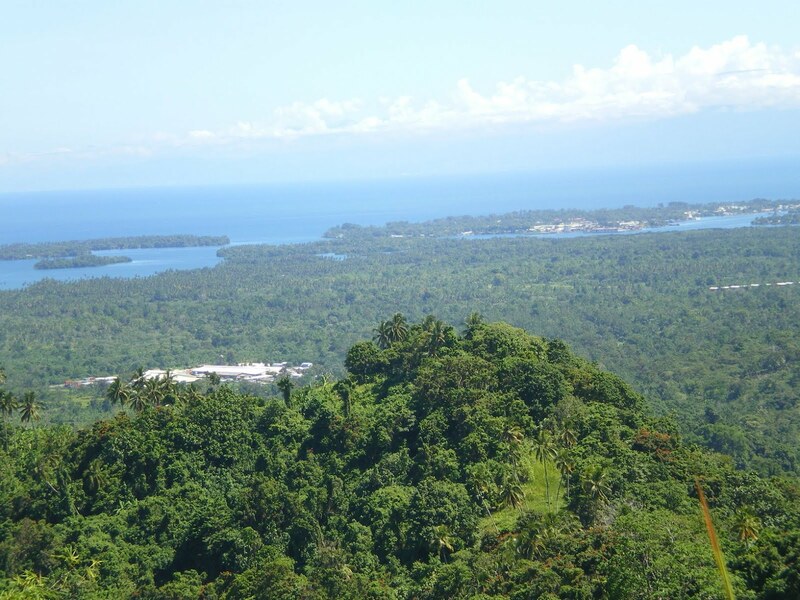 The center is located at the top of a mountain called Nobnob which has a spectacular view of the Madang harbor, airfield and surrounding area. However, to get to this location is a small dirt/gravel road that makes any Forest Service road that you have ever been on look like a super highway. The road if full of bumps, holes, drop offs and hairpin turns. 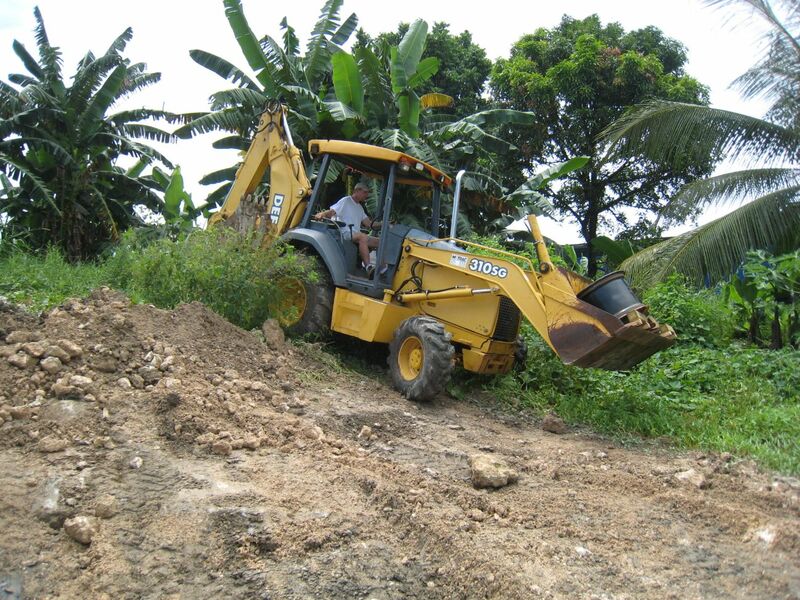 For years this road has been maintained by our staff in Madang using an old Ford tractor with a front bucket, but in the last four years this tractor has really gone downhill in its ability to mine rock and be reliable to help keep the road open. The staff has long desired a new machine and this past year funding was finally acquired to purchase a real backhoe to replace the aging Ford. You may be wondering why I am involved in this story since I am not stationed in Madang. Well I am the resident heavy equipment guy for our region (meaning that I have the most experience of anyone when it comes to anything bigger than a small four cylinder diesel engine). 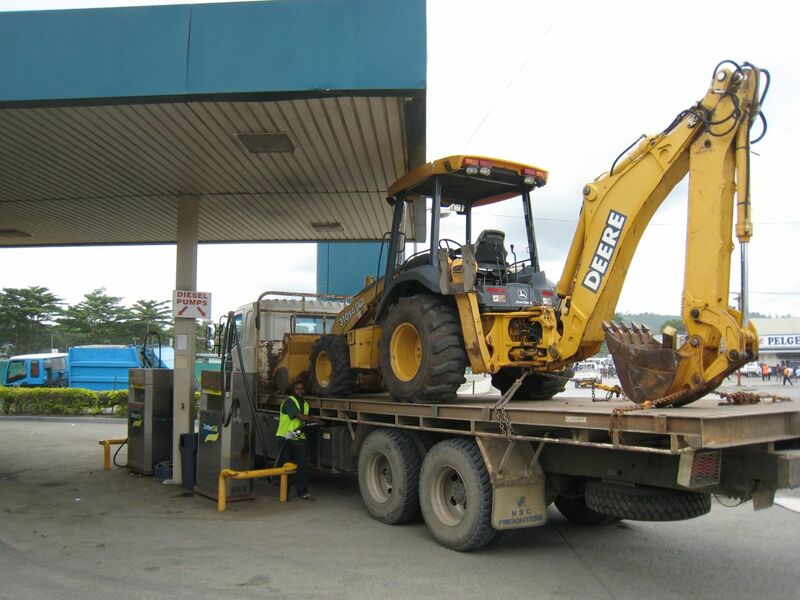 So about six months ago I started working with the team in Madang to help with technical advice in purchasing and transporting a proper machine to Nobnob. We found a used 2005 John Deere backhoe in the US that had low hours and the options that were desired by the team in Madang. 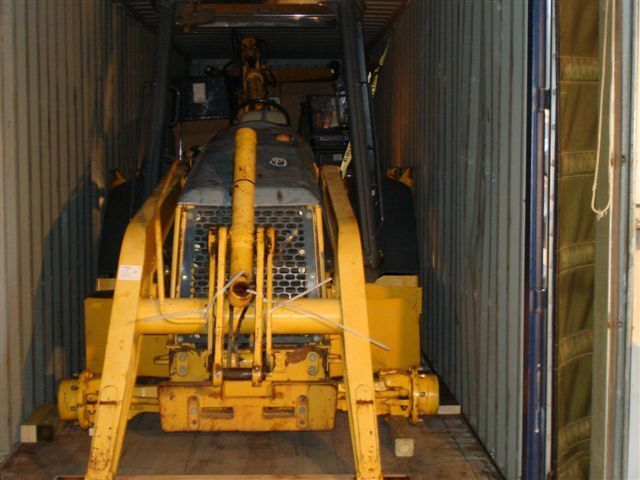 It was shipped to the JAARS center and stripped down for shipment inside a 40 foot extra-high container to PNG. In order to get the machine to fit inside the tires had to be removed from the rims. 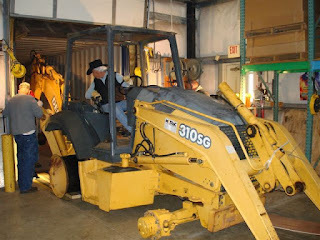 The front tires and wheels were also completely removed and using the hoe as a counter balance, the backhoe was driven into the container on 2x6 timber “tracks” and other cargo packed around it. 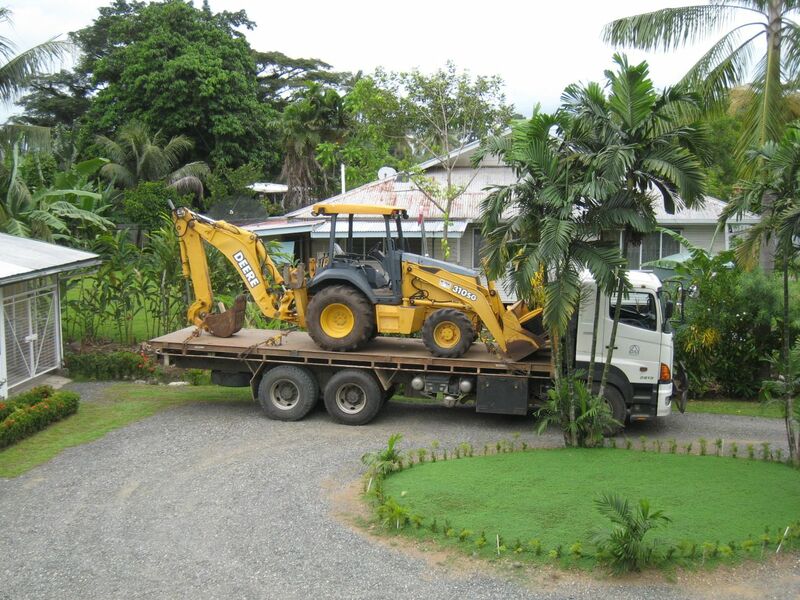 We were told by the JAARS team that packed it that we needed to make sure we had a nice level place to unload the backhoe in PNG. We always kind of chuckle at that thought as we usually have to drag things out in the gravel and dirt with a beat up old steal ramp to get things from the container to the ground. 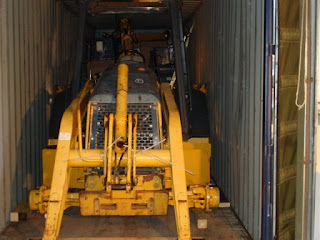 Anyway after months of waiting for the container to make its was from Savannah, GA to Lae, PNG and then for customs to clear the container we were finally allowed to go down and open it up and unpack the backhoe and reassemble it. It took about a day and a half to put it all together. We had to get it out of the container and on the ground and get the wheels back under it. 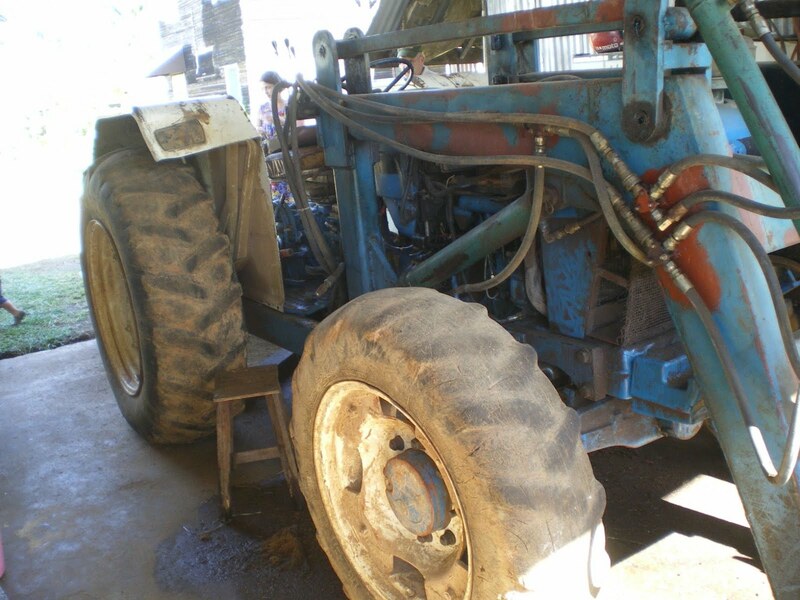 Thankfully with a backhoe you have lots of hydraulic arms available to lift the machine in to the air so we quickly removed the rear rims and took them to a local tire shop to have the tires remounted. So while we did this the rest of our shipping department was able to unload the rest of the cargo and load our truck for the cargo to be hauled to Ukarumpa. Once all the tires were under it we bolted the plastic top back into place that holds all the lighting and then drove it to our Lae guesthouse. 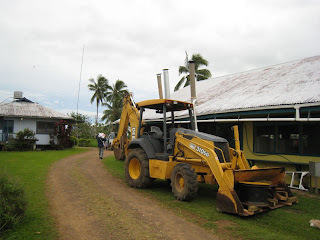 The next day we pinned the front bucket in place and made all the final checks that everything was where it needed to be and we had to leave the machine until the next week to get to Madang. Before I talked about how the highway to Madang is an okay road and sometimes impassable. Well for about two months leading up to backhoe arriving we began discussing how we were going to get the backhoe from Lae to Madang as the road can be very challenging and did we want to risk our only large highway truck on this type of trip. We looked into putting it on a barge or flat bottom boat and have it sailed around or hiring another trucking company to haul it for us. 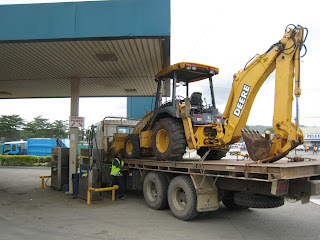 The other challenge that factored into this was how to get the backhoe loaded and unloaded on a truck at both points. In Lae I have a good relationship with some of the local heavy equipment dealers and they let me use their loading dock from time to time for just such instances and here in Ukaurmpa we have actually two loading docks that can be used so usually this isn’t too much of a problem, but Madang we found out there aren’t any “real” loading docks to be found. Right before Christmas I had been to Madang on holiday and the road was in great condition, but just after Christmas there were heavy rains and the road had gone into poor shape and only one trucking firm based in Madang was still running to the road. The boat was still an option, but getting it scheduled on a boat is always a challenge and the cost was more than trucking it. We continued to wait and see. A couple weeks before the backhoe trip was supposed to happen the senior class at the high school had their annual trip to Madang and their report was the road was in good condition. So we made the decision that we would use our truck and I would go along with the driver to make sure all went well on the trip. So on a Monday morning I rode with the truck to Lae and loaded the backhoe. Early the next morning (5am) the driver and I took off for Madang. The first half of the trip was pretty uneventful and smooth, but once we got into the rough mountain portion we were not sure what to expect. Since it had rained the night before the road was a bit slick in spots, but honestly everything went really well. There was only one spot where the road was really slimy, but following the advice of another truck driver we asked on the road we just stayed in the middle (the road is unpaved so there are no lane markers that you have to follow) and by driving down the middle of the road everything went great. 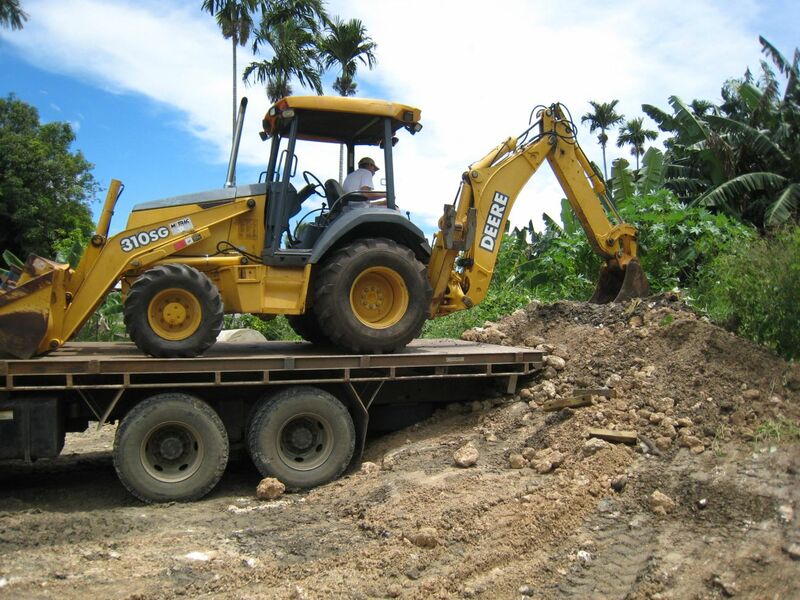 We arrived in Madang right at noon and met up with our Madang staff to find a “hill” to unload at. There was a local construction company that graciously allowed us to use their dirt/bush/large blocks of concrete pile to use for unloading the backhoe. The problem was it was not square enough to fit up to the back of the truck so we had to get their loader operator to build up the pile and then we backed the truck up. 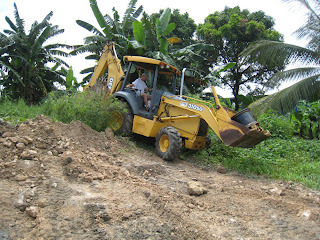 Once backed up I had to use the hoe on the back of the backhoe to push the dirt back that was mounded a bit too high and then I was able to drive the backhoe off. Once on the ground in Madang my job was done. 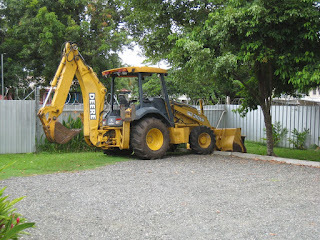 I was most happy to turn the keys over to the Madang staff and to feel happy that after much worry and prayer we had finally gotten the backhoe from America safely delivered to Madang and ready for work. By 3 pm we were all on the top of Nobnob with the newly delivered backhoe. The rest of the staff was happy to see it. We spent the night and at 7am I was heading back to town for the journey home. This time I helped the driver get the truck fueled and then let him take the truck back to Lae to pickup other cargo for Ukarumpa while I flew back via the round about way of Goroka, but that is another story. Wowed Zowee, Brian!! That's a neat & exciting story & a wonderful example of what missionary work really is, being there for others in a world where they otherwise wouldn't see Jesus!! God Bless!! !